Credit: Robert Gao/Case Western Reserve University. In a new study, researchers try to figure out how robots will interact with human co-workers in factories of the future. The study is conducted by Case Western Reserve University engineers, their colleagues at two other universities and an Italian-owned company in Michigan. Robots are increasingly used in manufacturing work. However, the true human-robot workplace collaboration is still in the early stages. Many researchers predict that humans are responsible for the more-nimble decision-making, while robots can contribute by lifting heavy tools or putting the right tool at our side when needed. In the current study, the team examined various aspects of robot-human collaborations in manufacturing workplaces. They suggest robot-human collaboration is not easy because it requires the robot ‘knowing’ or interpreting the human’s body language and hand movements, anticipating what he’ll do next. Researchers need to use sensors, computer models, and artificial intelligence to help make the robot safely and efficiently collaborating with human operators. If robots and humans can collaborate well, manufacture can be safer and more efficient because robot workers take on more dangerous jobs. Robots can also help train newer workers because they already “knowing” what tools and parts are needed for a task. They can do the training better than recently hired human workers, who may still be learning. The team’s work will focus on the prediction part of the robot-human collaboration. They will find how to teach robots to reliably recognize sometimes random human motions in a variety of different workplace scenarios. One researcher of the study is Robert Gao, Chairman of Mechanical and Aerospace Engineering. 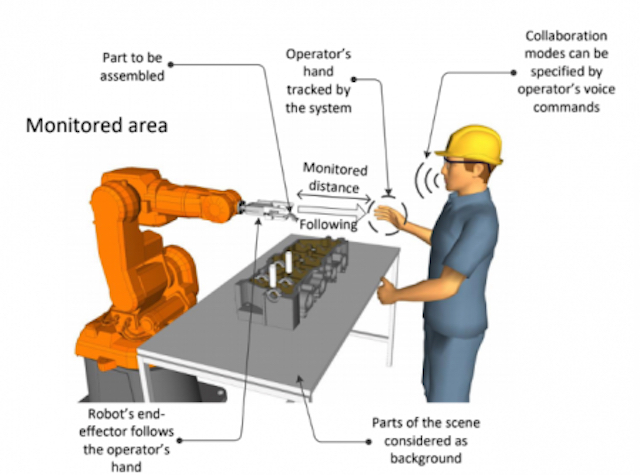 The project, Intelligent Human-Robot Collaboration for Smart Factory, is supported by a $1.5 million National Robotics Initiative grant from the NSF.